With its single tower rising powerfully over the city, Malaga’s cathedral is a sight to behold. The imposing structure, known locally as “la manqueta” (“the one-armed woman”) is easily at the top of most visitors’ lists. Equally impressive both inside and out, Malaga’s stunning cathedral deserves all the hype it gets and more. And despite it being a major tourist attraction, there are some seriously great places to eat nearby. You just need to know where to look! 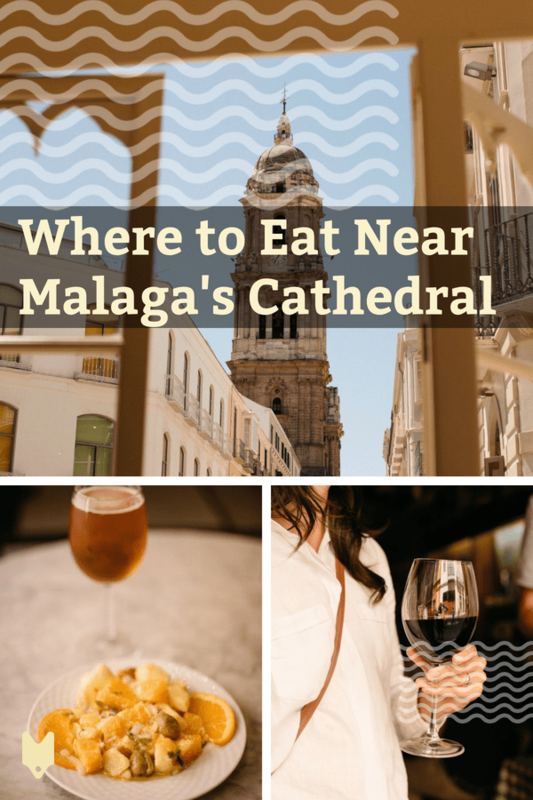 Here’s where to eat near the cathedral in Malaga for an authentic malagueño experience. Located just across Plaza Obispo from the towering cathedral, classy restaurant L’experience offers visitors an experience unlike any other. 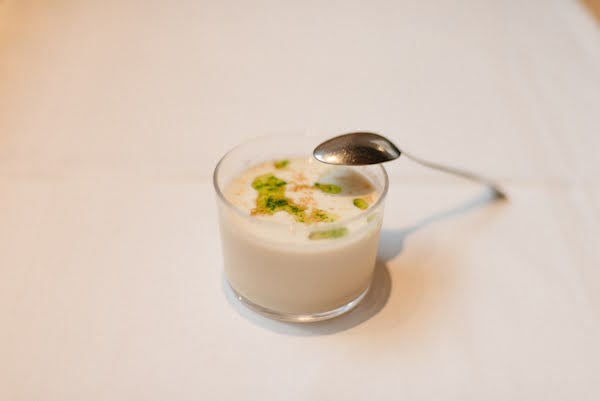 Their passionate team constantly seeks out the new, the modern, and the pleasantly surprising when it comes to food. Many of their recipes have roots in traditional Andalusian dishes, but have been reinvented in completely unique ways (we can’t get enough of the spinach and pine nut croquettes!). Its ideal location also makes it where to eat near the cathedral in Malaga with that special someone. The views can’t get more romantic than this! Croquetas and wine: just the start of an excellent meal! 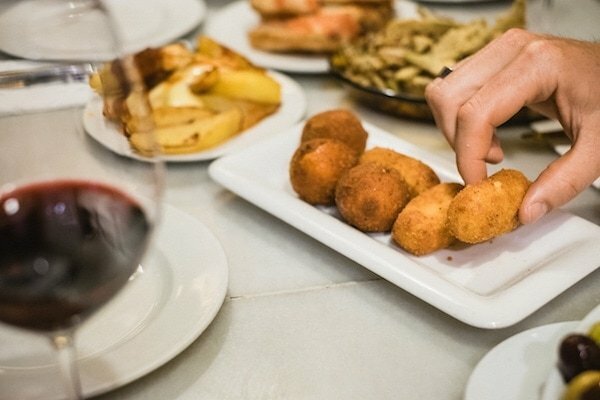 A fixture on the modern tapas scene in Malaga, Uvedoble Taberna is where to eat near the cathedral in Malaga if you’re looking for something new and different. Part rustic tavern and part gastrobar, this place beautifully marries tradition with innovation. The place is so popular that a few years ago, they had to move out of their original cozy space and into a minimalist, modern locale that fits nearly three times as many customers. However, it’s still packed with locals more often than not as a testament to its greatness. Try the award-winning ensaladilla rusa with shrimp or a refreshing tapa of red tuna tataki with creamy porra antequerana. Ensaladilla rusa is one of our favorite tapas on a warm summer day. Looking for something healthy, natural and refreshing? Byoko is calling your name. This cozy cafe down a side street near the famous church is where to eat near the cathedral in Malaga if you’re in the mood for a healthy breakfast or lunch. It’s only been open for a little more than a year, but has quickly become a reference for natural food in the city. Everything is made fresh to order using seasonal ingredients, and the wait staff will go out of their way to make sure you’re happy and comfortable. They serve the best açai bowl in the city as well as delicious risottos, toasts and more. Gluten-free guests will also be well taken care of here, thanks to their wide range of celiac-friendly options. 40 years ago, Francisco Ramírez opened the original El Refectorium restaurant in the Malagueta neighborhood to overwhelming success. His son, Sergio, has continued the tradition with this sister bar near the cathedral. El Refectorium Catedral maintains the integrity of traditional Spanish and malagueño cooking in a laid-back, contemporary setting. Sergio himself hand-picks the freshest ingredients on offer, including the best seafood from Malaga and nearby coastal cities. From exquisite seafood to refreshing ajo blanco soup and so much more, this is where to eat near the cathedral in Malaga for a truly local, traditional experience. You can’t get more malagueño than ajoblanco! One of Malaga’s most storied and legendary restaurants is less than a five-minute walk from the cathedral! 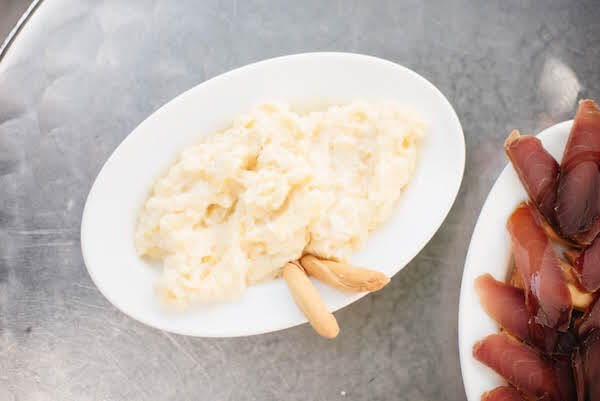 Mesón Mariano is home to traditional Malaga home cooking at its finest. From mouthwatering artichokes to exquisitely fresh bacalao (salt cod), everything you eat here is guaranteed to be fresh and bursting with flavor. In fact, owner Mariano himself brings ingredients fresh from the market every single day! This commitment to quality and the family-style atmosphere will make you feel at home right away. You won’t want to miss this true gem! 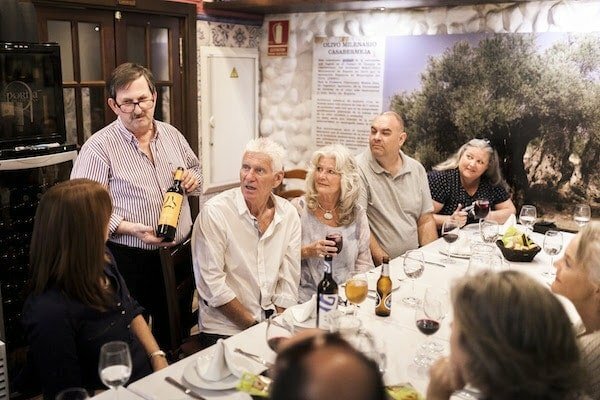 A family-style meal at Mesón Mariano is always a good idea. 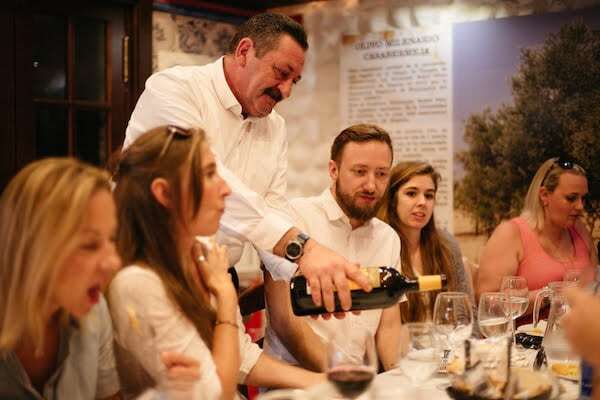 Join us for lunch at Mesón Mariano on our Best of Malaga: Foodie Feast & Cultural Walking Tour! It’s just one of five incredible stops spread out across a fun-filled morning and afternoon. From tapas to drinks to sweet treats and more, you’ll taste it all and learn the secrets of eating like a local. 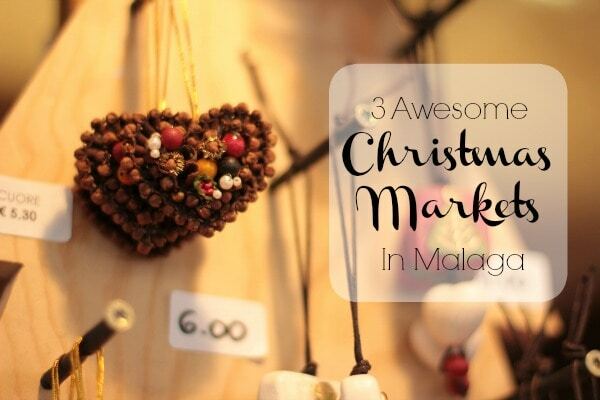 We can’t wait to welcome you to Malaga soon!